Many of you reading this probably have memories of an event in our area that has simply become known as “The Flood of ’98.” Some may have recollections more vivid than others, depending on how much damage or loss was suffered at the hands of this furious flood. For one area small business, the loss of their family-owned restaurant, Hotshot’s, was felt by many, reaching far beyond the establishment’s proprietors. Hotshot’s Lakeview Camp, on Lake McQueeney, originally opened in 1949 by Winfred “Hotshot” and Ellen Hartman. Located at 800 Hotshot Lane, the restaurant sat directly across the river from Treasure Island. 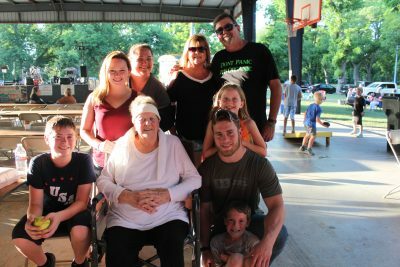 Locals and tourist loved coming for the Friday night fish fries that were held outside the restaurant, including the Silvia family, who frequented the campgrounds while stationed at Randolph Airforce Base and became fast friends with the Hartmans. In fact, Phil and Eileen Silvia were so fond of Hotshot’s, they purchased the property in 1972. When the Silvias took over Hotshot’s, they made sure to keep those famed Friday night fish fries going, available throughout the restaurant instead of only outside. People came from miles around to stand in line for the fried fish plate, catfish or cod, that included coleslaw, pickles and onions, french fries and the famous green bean salad. Phil and Eileen’s culinary capabilities weren’t only limited to frying fish. Burgers, fried chicken, frog legs, ribeye, chicken fried steak and even enchiladas were also popular picks. As great as the food was, Hotshot’s draw was so much more than their menu. The atmosphere was always welcoming and friendly. If you weren’t already going there to meet up with friends, you would surely make some new ones by the end of the evening. This openhearted ambiance was created by Phil and Eileen genuinely and naturally, and it was contagious. They created a place people simply wanted to be. Hotshot’s was a family business that made their customers feel like part of the family. You can imagine why this particular loss was felt by so many after the flood of ’98. The flood of ’98 came quickly and fiercely, as the waters of the Guadalupe River rose, leaving a trail of devastating destruction behind. Sadly, on October 17, 1998, Hotshot’s was one of the casualties. Although the building was left standing, the damage was beyond repair. The restaurant was a lost legacy, now only a fond memory in the minds of those lucky enough to have experienced Hotshot’s before the flood… or was it? Now, you may be thinking, “Great. So, this awesome place and its wonderful food is gone. How does this benefit me, except for telling me about all the good times and great food I missed out on?” Oh, no, my friend. Thanks to the Seguin Chamber of Commerce and the annual Hotshot’s Reunion and Fish Fry, you can experience the fun, food and fellowship of Hotshot’s for yourself! According to Frazar, Neice Bell, publisher of the Seguin Gazette and chamber member at the time, approached her with the idea of bringing Hotshot’s back as a chamber fundraiser. “Neice heard so much about the restaurant and what it meant to the community, and she brought up to the board the possibly bringing it back. Then, of course, she asked me,” said Frazar. 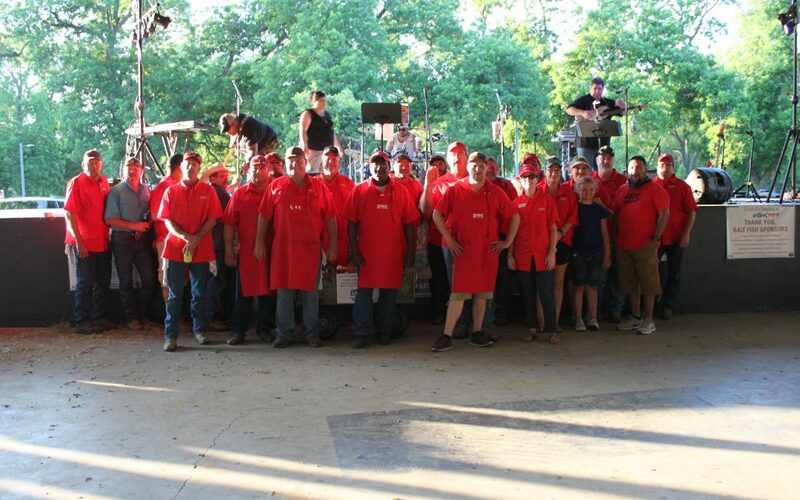 In 2011, the first Hotshot’s Reunion and Fish Fry was held and met with much success. GVEC proudly takes part in the event every year. The GVEC cook team and employees are on hand to help members of the Silvia family, including Miss Eileen, herself, and others prep and fry fish and serve food. The traditional plate of fried cod fish, french fries, coleslaw, pickles and onions, and yes, that legendary green bean salad is served up, along with a heaping helping of nostalgia and good times. This year, the Hotshot’s Reunion and Fish Fry takes place on Friday, April 26, with food being served from 5 to 8 p.m. Musical entertainment will be provided by Cinco Variety Band. Tickets for the meal and event are $15. To get your tickets online or learn more about the event, visit www.seguinchamber.com.